Augsburg College is hosting its first International Social Work Conference, June 14-15, 2012 in Minneapolis, Minnesota. The conference will be an international exchange of social work practice throughout the world. Presenters are coming from India, Norway, Slovenia and South Africa, in addition to the United States. Breakout sessions will be held on Clinical Practice, Curriculum Development, Community Development, Macro Practice and Research. One offering in the Clinical Track on Thursday, June 14th is, “Wooden it be nice? Using Family Sculpting in Social Work Practice – An International Tool for Brief Assessment and Intervention” presented by Stein Hardeng, Diaconia College, Oslo, Norway and Julie Thorsheim, MSW, LICSW-MN, KST Associates, MN. This entry was posted in Events & Workshops on May 16, 2012 by Julie Thorsheim. 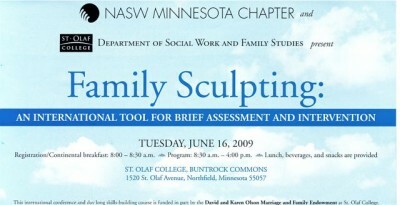 The Minnesota Chapter of the National Association of Social Workers and St. Olaf College are jointly sponsoring a continuing education workshop in Northfield, MN on Tuesday, June 16, 2009. Continuing education units are offered by the various professional boards. For more information and to register, go the the NASW-Minnesota Chapter website. This entry was posted in Events & Workshops and tagged Australian guest presenter, continuing education workshop on May 19, 2009 by Julie Thorsheim. This entry was posted in Events & Workshops on August 22, 2008 by Julie Thorsheim. * If you found this page first, click on WELCOME! for a quick overview of the whole site. KST Associates will be an exhibitor, with KST Family Sculpturing “hands-on” resources for assessment and therapy available for exploration and purchase. Julie Thorsheim, MSW, LICSW, will be there to interact with conference attendees and demonstrate representational family sculpture. For more information on this daylong event and to register, visit MAMFT at www.Minnesotafamilies.org. This entry was posted in Events & Workshops on March 30, 2008 by Julie Thorsheim.